Give your dining setup an alternative seating option with this simple yet rustic Dining Bench. 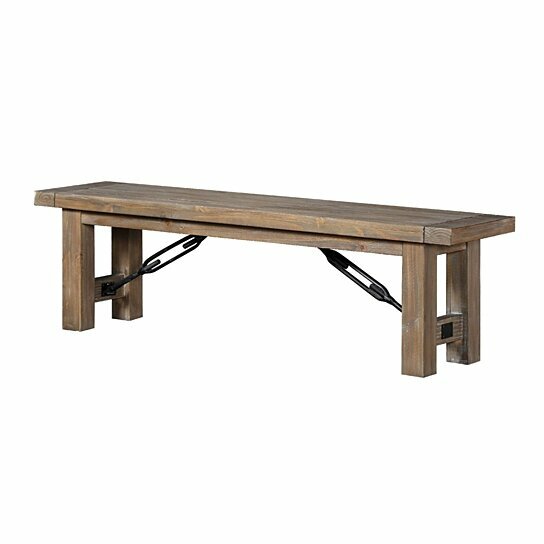 Made from solid wood, this bench replicates the look of historical farmhouse with the warm appearance of reclaimed wood. The flint oak brown finished planks of Acacia butcher blocks form the top of this bench while cast iron tension rods and cross-bracing provide a durable industrial-style foundation to it. Add this bench on the longer sides of your table as dining seat or as an accent piece in your living room or entryway. The bench features thick block legs and durable metal stretchers. The bench is made entirely from acacia wood for long lasting utilization. The bench can easily accommodate two to three persons.